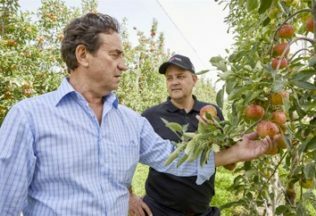 Australian fruit producer Montague will be supplying Coles with Smitten apples for a second season. Montague first introduced Australia to Smittens in February 2017, an apple that blends Gala, Braeburn, Falastaff and Fiesta varieties. Smitten’s have a firm flesh, making them resistant to bruising. Available at select Coles supermarkets from Valentine’s Day 2018, the apples will only be sold for a limited time. Coles Fruit Business Category Manager, Daniel Williams, said Coles is excited to again work with Montague to provide its customers with a unique apple variety. “We hope they’ll [our customers] be as smitten with the sweet crunch of this special apple as we are,” Williams said. The Smitten was among a number of new apple varieties first launched in Australia by Montague in June 2016.